Thanks to the 262 of you who took the time to pick a team for this trial – I’m pretty happy to have gotten so much interest in it, so I’ll definitely be running League 1 and League 2 versions ahead of this weekend and then a full set of three next weekend. In the meantime, here are some quick stat graphics ahead of this round of games so that you can see how your selections compared to the wisdom of the crowd. I’ll look to share final results as soon as I can after tomorrow’s games finish. First of all, here’s how the team choices break down, shown by fixture. There’ll be a lot of managers hoping for big Birmingham and Hull home wins tonight, while the outcome of Brentford v Aston Villa tomorrow could be what makes or breaks many gameweeks. 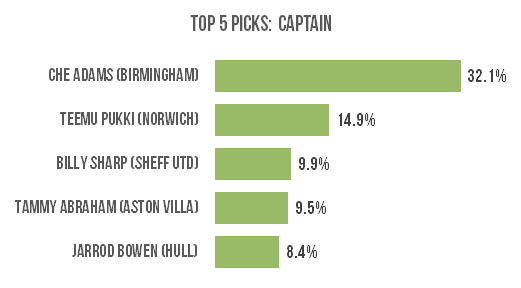 The most popular choice of captain emerged quite early: almost one in three managers are supremely confident that Che Adams will bang in a few at home to Bolton, with Norwich’s Teemu Pukki considered a decent shout at Preston. 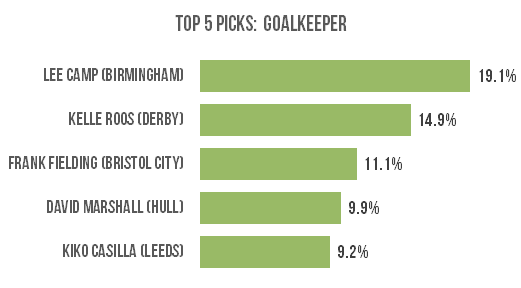 Birmingham also lead the way for goalkeeper selections, although it’s a closer-run thing. Nearly one in five managers will be hoping that Lee Camp keeps a clean sheet this evening. 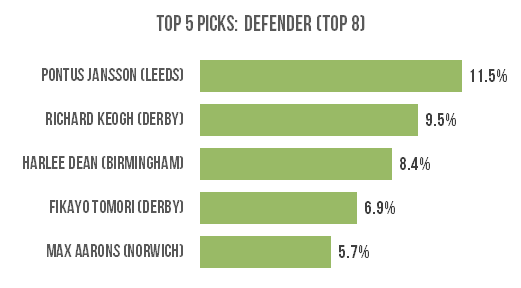 Popular in real life, Pontus Jansson is also the most popular defender at a top 8 club for this round of fixtures. There are two Derby players in the top 5 and three in the top 7, so a rare Ipswich win wouldn’t go down well here. 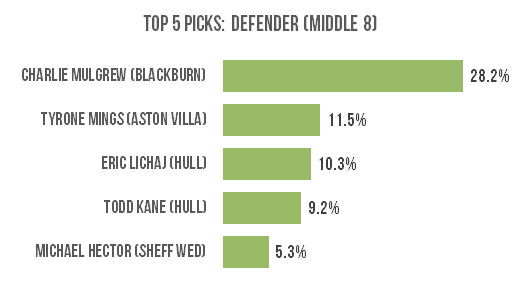 Charlie Mulgrew’s reputation precedes him – he would have been the top-scoring League 1 defender last season based on my analysis and he’s garnered over twice as many selections as anyone else in this category. 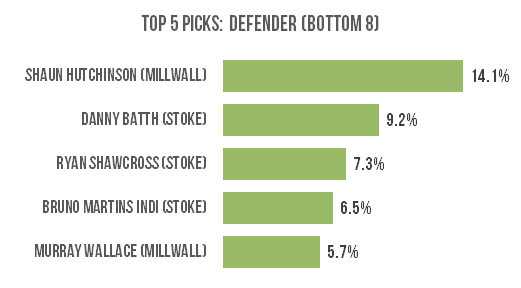 Millwall and Stoke are the popular choices here, making up not only the entire top 5 but also the the entire top 7. Shaun Hutchinson is the standout pick as his team host Sheffield Wednesday, but plenty of people think that Stoke will keep Wigan out despite being the away side. 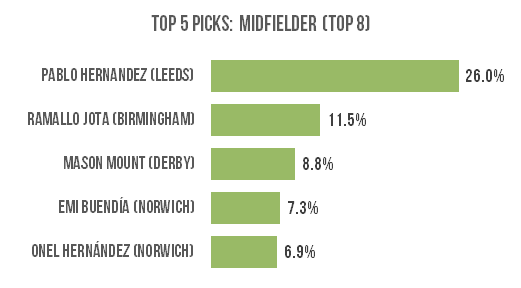 Pablo Hernandez is an unsurprising top choice given that he only missed out on the Leeds captaincy by a single point. Over one in four managers fancy him to perform well at home to Swansea. 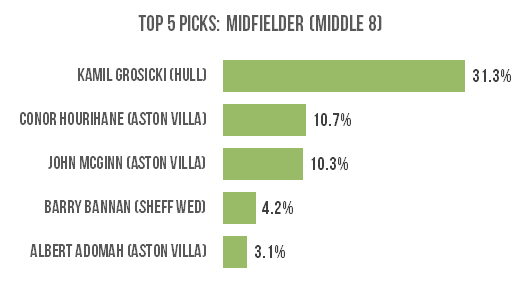 Kamil Grosicki is the standout favourite here, garnering almost three times as many picks as anyone else. Hull have a straightforward game on paper at home to Rotherham and Grosicki has already been involved in 14 goals this season, so I’m not surprised that he’s so popular this week. 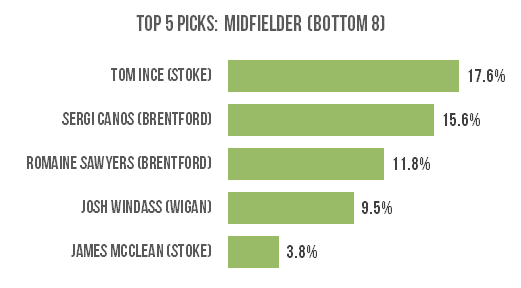 Tom Ince of Stoke gets the most nods despite having an away game at Wigan, which is interesting given that a Latics player is fourth in the list. 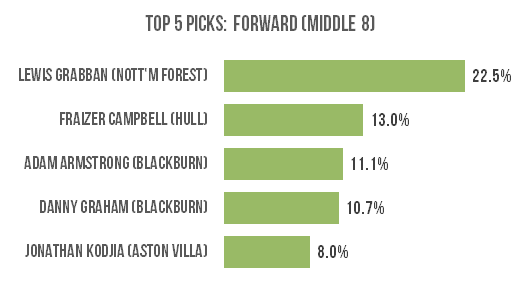 Brentford’s Sergi Canos and Romaine Sawyers – who have Aston Villa to deal with – round out the top three. 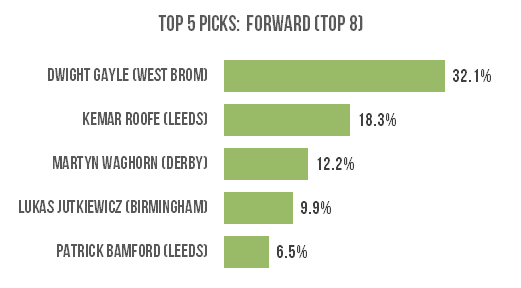 Dwight Gayle and Kemar Roofe have been the standout performers for their teams in expected goals terms, so it’s no surprise to see them popular here. Patrick Bamford is the edgier choice for Leeds, also making it into the top five. Despite being away at West Brom, Lewis Grabban was the standout choice among mid-table forwards this week with nearly one in four managers opting for him. Interestingly opinion appears divided on whether Adam Armstrong or Danny Graham is the best option for Blackburn’s trip to Reading. 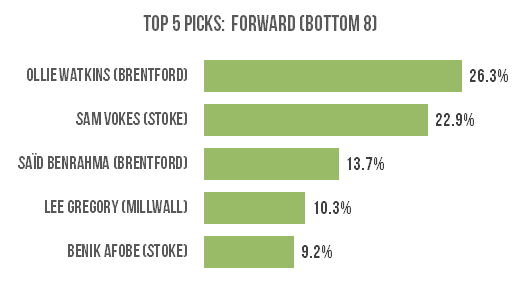 It’s a two-horse race between Ollie Watkins of Brentford and recent Stoke signing Sam Vokes, who between them account for just under half of all picks in this category. With both teams having another representative in the top five picks, it’s clear that plenty is expected from them this weekend. Once again a huge thank you to those who have given this game a go. I’ll run a quick check of the numbers tonight and do a full round-up tomorrow evening and announce the winners. After that, it’s on to the League 1 and League 2 trial this weekend and all being well I’ll run all three in parallel next weekend.